A project that identified and tested a bioinformatics program that can help identify underreported suicides linked to drug overdoses was awarded the first-place distinction at the 2018 Intel International Science and Engineering Fair (ISEF)–the world's largest science competition for high school students. The awards are coordinated by the National Institute on Drug Abuse (NIDA), part of the National Institutes of Health, and Friends of NIDA, a coalition that supports NIDA's mission. The Intel ISEF Addiction Science Awards were presented at a ceremony Thursday night at the David L. Lawrence Convention Center in Pittsburgh. 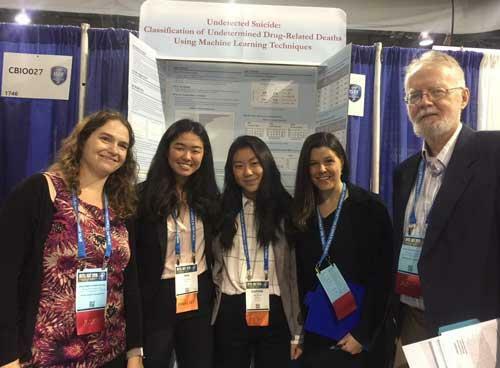 The first place award went to 17-year old Mia Yu and 14-year old Daphne Liu from West High School in Salt Lake City for their project "Undetected Suicide: Classification of Undetermined Drug-Related Deaths Using Machine Learning Techniques." The two students compared three machine learning models to determine how well they could identify undetermined overdose deaths as actual suicides. Using existing machine platforms, they first plugged in overdose deaths already classified as either suicide or accidental. From there, they identified the most accurate computational model. They then used that model to measure the overdose deaths listed as undetermined. Using data from the state of Utah, the machine learning technique determined that drug-related suicide deaths were underreported by 34 percent. "These young women recognized a gap in our ability to accurately classify drug overdose deaths and developed a useful and cost-effective method to advance the science of detection, which can be challenging with co-occurring mental health conditions," said NIDA Director Nora D. Volkow, M.D. "Improving how we classify drug-related overdose deaths is critical to developing more targeted public health interventions for both drug addiction and severe depression, and can aid in surveillance for both." The second place distinction went to three seniors from the American High School in Freemont, California, for "LabTrak: A Micro-Telemetry Device for Modeling Mice Behavior." Rohan Arora, 17, Venkat Krishnan, 17, and Anil Tolwani, 18, developed a well-tested and lightweight non-invasive tool to measure mouse movements during the preclinical phase of medication development. The tool is designed to send data straight to a computer or even a cell phone. Buprenorphine and ketamine were administered along with controls to enable the young scientists to measure the reactions of the mice to medications. They were able to develop a chip sensitive enough to determine the difference between specific types of mouse actions, including running, scratching, turning or head movements. The chip is even designed to "sleep" while the animal sleeps to preserve the battery. Winning third place was Saadh Ahmed, a senior from Northview High School in Johns Creek, Georgia, for his project "Development of a Drug-Likeness Rule for Natural Products." In the early stages of drug development, scientists seek out compounds that are similar to others that show promise. While standard rules exist for identifying similar synthetic compounds, "drug-likeness" rules for natural compounds have not proven to be as nuanced or accurate. The 17-year-old student began with an analysis of a database that contains drug-like natural compounds, and evaluated them for patterns and commonalities. Using qualitative and quantitative screening techniques, he developed streamlined measures for identifying multiple natural compounds that could be worthy of study for specific health conditions. "Our second and third place winners found clever solutions to issues that are universal to medication development, underscoring the importance of building a pipeline of brilliant young scientists who can look at problems in innovative ways," added Volkow. The Friends of NIDA provides funding for the awards as part of its ongoing support of NIDA's research. "We were especially excited to see projects this year that not only can be applied to addiction science, but can also improve the way we tackle wide-scale scientific analyses and techniques," said William Dewey, Ph.D., president and chair of the Executive Committee, Friends of NIDA, as well as the Louis S. and Ruth S. Harris Professor and chair, Department of Pharmacology and Toxicology, Virginia Commonwealth University, Richmond. Emily Garcia from the Young Women's Leadership Academy in San Antonio for "What Influences Safe Medication Practices: Investigating the Relationship Between Parent's Intentions, Self-Efficacy and Knowledge." Sindhuja Uppuluri from Westwood High School in Austin, Texas, for "A Novel Approach to Substance Abuse Rehabilitation Using Transient Receptor Potential Channels and Insulin Signaling in C Elegans." Ishaan Maitra from Audrey Kell High School in Charlotte, North Carolina, for "A Quantifiable Method to Detect and Monitor ADHD: The Use of Facial and Motion-Based Behavioral Cues Analysis Using Deep Neural Network and RGBD Data." Ha Khoa Le and Phuong Nam Nguyen from the Nguyen Hue High School in Hanoi, Vietnam, for "The Study of Concentration of Urine Neurotransmitters of Dopaminergic and Serotonergic System and the Relationship to Behavioral Disorders in Patients with Online Gaming Addiction." Judges for this year's Addiction Science Awards included Dr. Michelle Jobes of the NIDA Intramural Research Program and Drs. Cynthia Conklin, Kenneth Perkins, and Mary Torregrossa, NIDA grantees at the University of Pittsburgh. This is the eleventh year NIDA has offered Addiction Science Awards at ISEF. See the new section on the NIDA for Teens site that follows the awardees' careers after the science fair. NIDA has developed a special section on its website to help science fair entrants understand the criteria for the awards. This year, about 1,800 students from more than 75 countries, regions and territories participated in the Intel ISEF competition, coordinated by the Society for Science and the Public. The nonprofit organization partners with Intel–along with dozens of other corporate, academic, government and science-focused sponsors–to provide support and awards each year. Addiction Science Winners receive cash awards provided by Friends of NIDA, with a $2,500 scholarship for the first-place honoree, $1,500 for second place and $1,000 for the third-place distinction.